It’s happened before. Many times before. I’m sitting in my living room with the rulebook in my lap, paging carefully through it. In the background Ross and Rachel bicker quietly on the TV, while further back I can hear my wife working in the office and the gentle whir of the stove-top fan that one of us forgot to turn off. I nudge my drink on the table revealing the ring of condensation that’s forming. My phone buzzes and I reach for it reflexively. Then I stop, my hand returning to the page in front of me, fingers underscoring the line that’s caught my eye. And I’m hooked. Reading board game rulebooks is tedious at best and soul-crushingly, mind-numbingly confusing at worst. Sometimes, though, as you move your way through a manual just hoping to be playing soon, a certain line, rule, or passage will make you shiver with excitement as you find yourself visualizing—clearly and concisely—what’s to come. GladiGala, the new skirmish/simultaneous-movement game from Tyto Games, gave me just such a moment. The game presents itself as something of a mashup of Onitama and RoboRally with a handful of extra steps and bits. Which is fine. But as I began to read about coins, moves, fighters, and damage, I found the premise wasn’t enough to keep my interest and the outside distraction began to take over. Should I finish reading later? My Netflix queue isn’t getting any shorter, after all. Until I reached the section of the manual describing “Declarations,” which is just a big word for “Making a prediction about how the entire game is going to go.” And that got my attention. 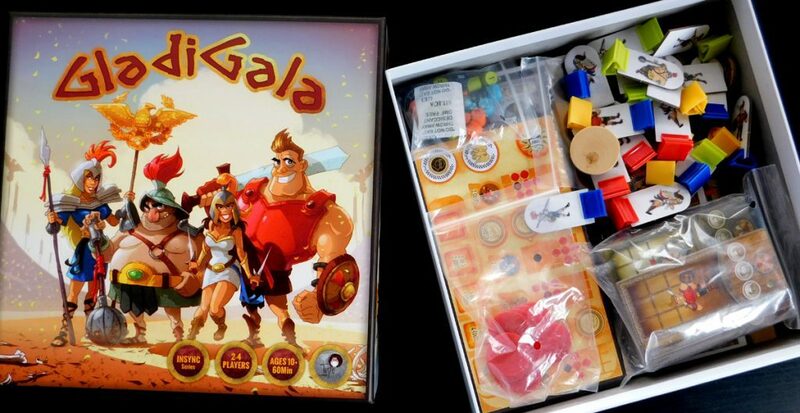 At its heart, GladiGala is a pretty simple game. 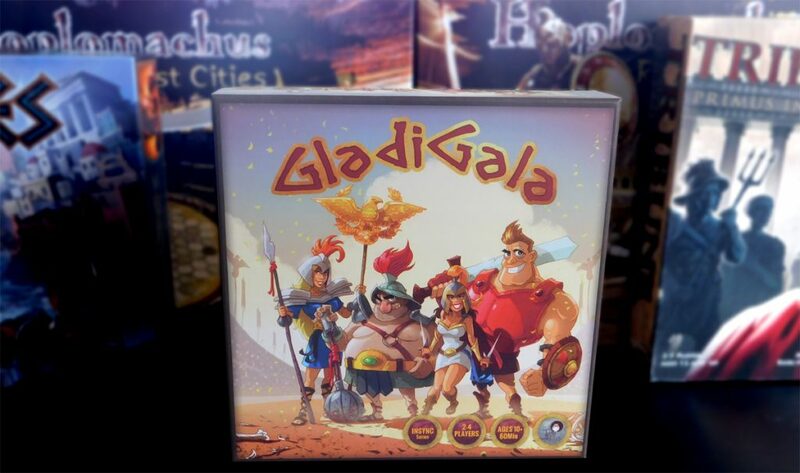 Players select a group of fighters (different fighters have different ranges and styles of attack, different vitality, and different abilities) and then battle out in the Colosseum in both a morning fight and an evening fight, with the most successful team being declared the winner. Success is determined in two ways. The first is to capture an opposing team’s banner from the field of play, and the second is to earn the most coins (which can be done multiple ways). Each round (day and night) one player will win a victory token, either by capturing a banner or by having the most coins after 5 fighters are eliminated from combat, which ends the round. If two different players have victory tokens, the player with the most coins wins. And these coins present a fascinating dynamic, so let’s focus on how you earn coins, and what caught my eye as I learned GladiGala. Unlike many similar games about keeping your movements hidden until the last second (Roborally, River Dragons), GladiGala has a currency at the heart of its engine. Sure, your character can move around at liberty (movements are chosen secretly using clever, magnetic tiles that you reveal in unison) but beyond that a lot of what you do, and what you can do, boils down to what you’re willing to spend. Coins can be earned three ways. First, players will earn coins on successful attacks. This is when—once gladiator movements are all resolved—you have pre-chosen an attack that connects with where an opposing gladiator is. This is easier said than done, so any time you manage to land a hit you not only damage (and possibly eliminate) that fighter, you also earn coins. The second method involves the use of crowd favor tokens, which I won’t get into great detail about, because really they’re an offshoot of the attacks and provide bonus coins thanks to attacking in friendly parts of the arena. And then we come to the third way to earn coins and the part of the manual that got me to sit up and pay attention: declarations. 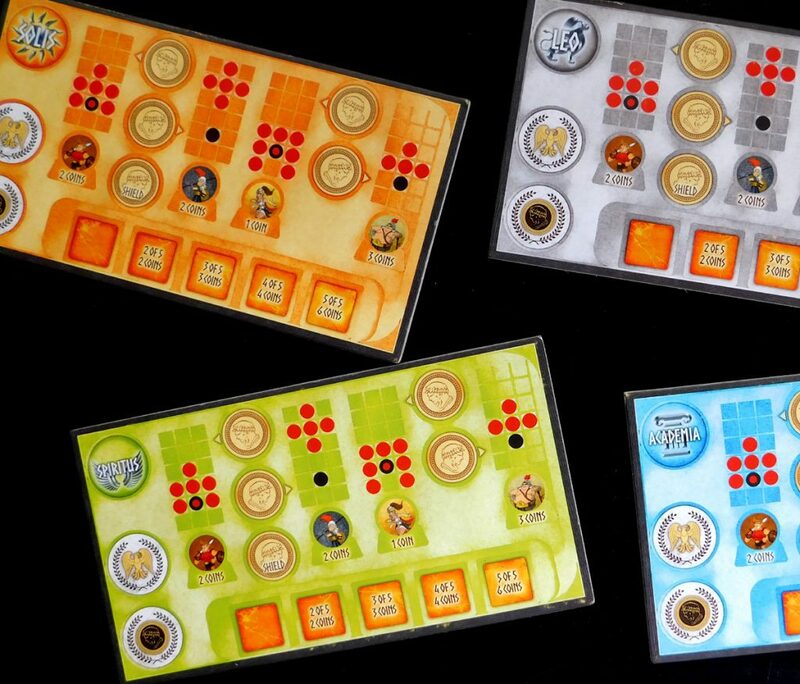 At the start of each of the two battle phases, players will predict (by placing color-coded tokens on their personal player board) who will suffer losses and in what order. So if I think that a fighter from the green team will be eliminated first, then I will select a green token for the first spot on my board. Obviously, you can’t choose your own, so basically what you’re doing is telegraphing to the every other player who you’re going to be gunning for and in what order. And this… this is brilliant. I’ve played a lot of games in this vein that I’ve hated, because at the end of the day a programming-esque game (this isn’t quite a programming game) of simultaneous movement is a very chance-based thing. That alone just doesn’t scratch the itch for me, which is why I mostly stay away from this genre. The betting, however, of who’s going to die and when, that’s the special sauce that makes this sandwich something special. Because it adds a crunchy layer of psychology (yes, I’m aware I just changed the metaphor. Instead of a sauce, the rule is now the potato chips in the sandwich) to the game, with players strategizing to either team up with other players and piggy-back off their goals or foil them by purposefully choosing predictions that are at odds with theirs. All of this provides just enough thinkyness (it’s a word, I swear) in what’s a fairly light game. Which brings me to my biggest complaint about GladiGala. For a game that does a lot with a little, there are many unnecessary bits here. At its heart, GladiGala is really a fleshed out Onitama with a dose of Camel Up wagering involved. And that’s the part of the game that hums. Bet, fight, repeat. It’s simple, understandable, and fun. Unfortunately, there are a lot of extraneous bits on top of that. There are a lot of little rules and systems that seem, while not bad, unnecessary for a game like this. 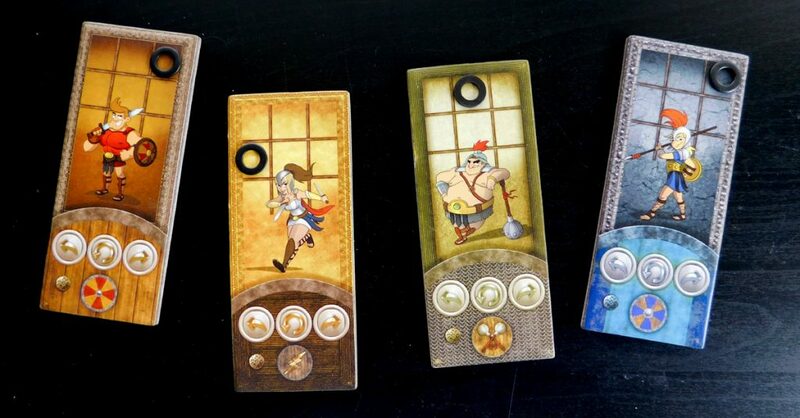 The rules of damage, elimination, upgrades, etc are all just a touch counter-intuitive when GladiGala bills itself as a fast-paced game in the studio’s Insync series, which sees players working simultaneously to speed up the game. That said, these bits become easier the more you play and I imagine (I haven’t had the game long enough to find out) that once everyone knows the ropes there’s very little downtime during play. Which is a good thing, because this game is whimsical and fun and clever, and a nice enough combination thereof that I would be comfortable recommending it for young players; 10+ is what the box states, and that seems fair. 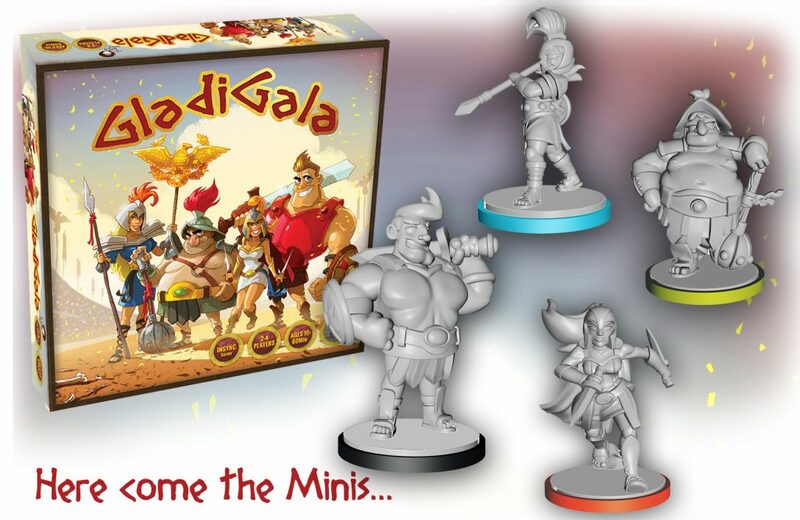 In fact, as I consider Hoplomachus, Blood & Sand, and others, I think it’s safe to say that GladiGala is the one and only game of gladiatorial combat that I would recommend for kids. But whether you have kids, don’t have kids, or prefer draw faces on your pillows and place them around the table like a family, it’s still probably worth taking a few minutes, heading over to Kickstarter, and seeing if GladiGala might tickle your particular brand of whimsy and cunning. The prototype used standee characters while the final product will have miniatures as seen in the promotional image above. Next postGizmos Review: Have the Inventors Lost Their Marbles?